In preparation for this week’s 10th annual Tomato Tasting at SSE Heritage Farm, I decided to gather some tomato knowledge. I began by going out to the SSE Preservation Garden Tomato Field last week with Steffen and Phil, the Seed Savers Exchange Evaluation Team, and learned how they categorize and evaluate tomatoes. Did you know that one way to classify tomatoes is by the color of their skin? Pink and red tomatoes, for instance, both have red flesh, but pink tomatoes have clear skin while red tomatoes have yellow skin. It is the difference in skin color stretched over the red flesh that makes the tomato red or pink. This pink tomato has clear skin. This red tomato has yellow skin. Another way to classify tomatoes is by their shape. Their shape can be described as currant, grape, cherry, plum, pear, pepper, globe, beefsteak, oxheart, stuffing, or ribbed, as illustrated in the photos. The shape of a tomato is determined by the size of the tomato flower. “Look at the size of this ovary,” Steffen remarks, holding up a yellow tomato flower. I look and am genuinely impressed by something I never even knew to look for until five minutes ago. Small, simple ovaries usually produce smaller fruit and large, compound ovaries produce larger, compound fruit. A compound (or fasciated) flower such as you see in this photo, produces a beefsteak tomato. I wander up and down the rows and admire tomatoes, tasting them here and there. 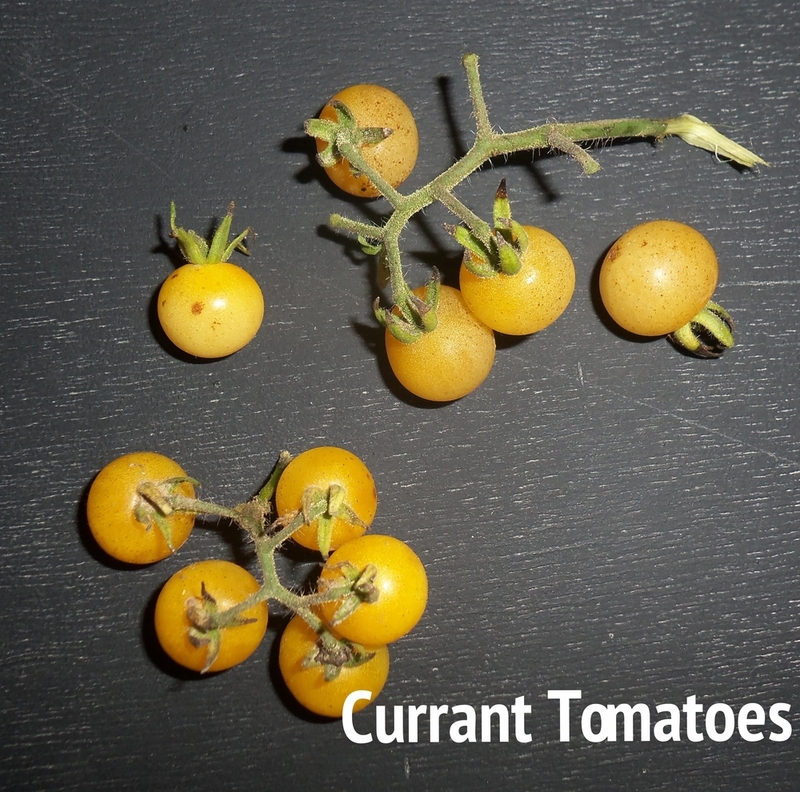 There are large and small tomatoes, yellow tomatoes, purple tomatoes, some that are still green. The “Tiger Tom” catches my eye with its yellow stripes and scarlet glow. When I mention it, Steffen and Phil agree it is beautiful and recount their favorites from yesterday. “Peppermint,” named not for its taste, but for its striped look, and “Purple Top” stand out to them. I find my taste favorite of the day: Livingston’s Paragon. Apparently, the tomato is named for its breeder, Alexander W. Livingston, a tomato breeder from the late 1800s who was among the first to breed fleshy, delicious tomatoes for the home gardener rather than the canning industry. I’m looking forward to learning and tasting more on Saturday, September 5, when Seed Savers Exchange hosts their 10th Annual Tomato Tasting from 1:00–5:00 p.m. We’ll have over 60 varieties lined up, cut into bite sized pieces and ready to sample. I’ve heard about the event from people in years past and seen many delicious-looking photos, but I’ve never made it to a Tasting myself. This year, I am excited to try it out. The day will include more than just tasting tomatoes. Enter by calling the Oneota Co-op at 563-382-4446 or enter online at oneotacoop.com. As both a tomato lover and a novice gardener, I love my time at Heritage Farm. As the Event and Volunteer Coordinator, my job is to bring people in to enjoy Heritage Farm and learn about the great things we’re doing here, but for the September 5 Tomato Tasting, the tomatoes do that job for me. It’s just up to me to extend the invitation. September 5 from 1:00-5:00 p.m.